Estrogen receptor (ER) expression status is an independent factor predicting response to neoadjuvant systemic treatment (NST). In the current study, we aimed to investigate the characteristics of NST response and benefits of extended NST cycles according to ER expression status. 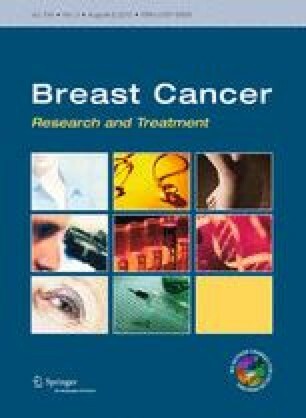 We investigated the outcomes of different durations of anthracycline-taxane-based NST in 377 operable breast cancer patients treated between Aug 2008 and June 2011. In 89 patients, the serial radiologic tumor response was assessed with either ultrasonography or computed tomography. Ninety-six patients (25.5 %) received extended cycles of anthracycline-taxane-based NST (6–8 cycles) and 281 patients (74.5 %) received 3–4 cycles of NST. Treatment with extended cycles of NST led to a significant increase in the pCR rate in ER-positive tumors only (2.1–11.7 %, p = 0.008 for ER-positive tumors and 20.0–19.4 %, p = 0.941 for ER-negative tumors). Serial assessment of radiologic tumor size during extended NST therapy revealed continuous shrinkage of ER-positive tumors during the chemotherapy cycles, while ER-negative tumors mainly achieved size reduction during the first 3–4 cycles with no significant additional tumor shrinkage during the extended cycles of NST. In this study, we report a distinct pattern of response to NST according to ER expression status in breast cancer. Our observation generates the hypothesis that the optimal duration of NST can be tailored to the molecular phenotypes of tumors. Hyeong-Gon Moon and Seock-Ah Im contributed equally to this study and are co-first authors. This study was supported by the Global Frontier Project grant (NRF-M1AXA002-2011-0032148), the Basic Science Research Program through the National Research Foundation of Korea (NRF) funded by the Ministry of Education, Science and Technology (2012R1A1A2005929) and the National R&D Program (122020) for Cancer Control, Ministry of Health & Welfare, Republic of Korea.